Magic Weapon is a Conjuration Wizard skill unlocked at Level 20, making her weapon magical and increasing damage. This damage does not translate into spell damage, and the effect and function of this skill and its runes is not clearly or obviously displayed in the game. It seems from early observations that this skill was meant as a supplement to the Battle Mage build idea, but as that sort of variant is not viable in the final game, this skill seems like a leftover that's out of place. Fans hope it can be reworked in some way in a patch. When the need for physical combat arrives, the Wizard is well prepared, fusing her weapon with magical energies, cutting deeper into her foes even when using such a mundane thing as a physical weapon. Refer to the Magic Weapon rune effects article for thorough descriptions of all five rune effects in this skill, including screenshots, videos, strategy tips, and other related information. This skill is clearly designed to enable a Wizard to play in the Battle-mage style, going melee combat for better or worse. The Wizard isn't really designed for that approach, but by pairing the melee damage with excellent equipment/weapon, and some intelligent defensive spell use, it may be a viable build. 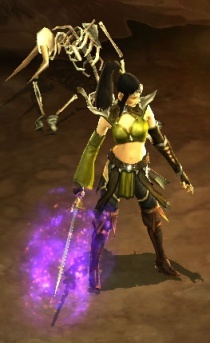 Magic Weapon was first shown at BlizzCon 2008, when the Wizard debuted. Back then, it was a Tier V skill in the Conjuring Skill Tree. Together with spells like the VERY similar Weapon Mastery (gone), Damage Resistance (gone) and Spectral Blade (still in), it gave a hint of seeing the Wizard getting the capability of going melee. One of the odder Wizard skills, seemingly designed for a melee fighting Wizard. We don’t know enough about weapon damage in general to have any idea if this is a big bonus or not. Nor do we know if this damage is boosted by attributes and +magical damage item modifiers. If so it’s possible that some Wizard builds could deal very good weapon damage. On the other hand, there are enough limits on which classes can use which weapons that Wizards might be limited in their melee damage no matter what they tried. Skill tiers were removed for the July 2011 Press Event, allowing skills to unlock steadily from levels 1 to 30. Consequently, all skill levels were adjusted and Magic Weapon became a level 7 skill. With the Patch 13 changes, Magic Weapon was classified as a Conjuration skill and bumped all the way up to level 20, taking it out of play in the beta. See the Wizard skill archive for more details on previous versions of Magic Weapon and other Wizard skills. Or see Magic Weapon (BlizzCon 2008) for the original version of this skill. Magic Weapon is an modified version of Diablo II's Sorceress skill Enchant, but activated like a buff, rather than cast on a target (thus it’s only of use to the Wizard and can not be shared to others). This page was last edited on 12 June 2012, at 21:09.